The 211ST 21" subterranean subwoofer was developed for high SPL bass output outdoor applications. It features a powerful 21" transducer for maximum excursion and SPL. Due to the high power handling of the 211ST, no 70V version is offered. The 211ST can be directly driven by an M1000 subwoofer amp which produces 70V of output, or 1000W+ at the 4ohm rating. However, at 1000W, wire loss needs to be considered and calculated as with any other 4 ohm wire run. In all applications, the 211ST should be bi-amped. Also, the 211ST is quite heavy. Four eyebolts are located on the top to allow the subwoofer to be lowered into the ground. Traditional 70V speakers will have a transformer as the load. Because tranformers react differently to DC and AC signals, an ohm meter reading will measure the DC resistance (DCR) of the transformer and will not provide any info on the actual rating of the speaker when passing audio, and might even read near 4 or 8 ohms which might indicate incorrectly, it is a 4 or 8 ohm speaker. In the audio band, the impedance presented by the transformer will be much greater than the DC resistance. Unlike traditional 70V speakers, James Landscape sats, the AT series, also feature an additional low frequency roll off via a built-in network to protect the speaker as well as allow running the sats on the same line as a subwoofer. These features block all DC signals, making an ohm-meter useless for testing as it will measure "open circuit" on both 4 ohm and 70V speakers. So the speaker must be measured with an 70V IMPEDANCE METER which characterises the IMPEDANCE at 1kHz, not at DC RESISTANCE. Examples follow the table. Below is a table which shows impedance and DCR reading to be expected on AT sats and ST subwoofers. Fig 1 shows three examples of 70V impedance measurement tools; the TOA ZM-104A, the TENMA 72-6948, and the Dayton Audio DATS2 speaker testing software. 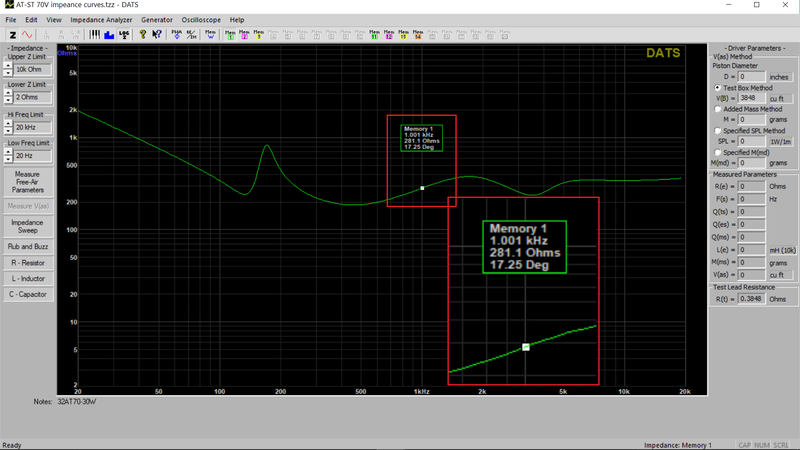 The two impedance meters test at only 1kHz which can give you readings which may appear out of spec, where as DATS2 gives you a full 20Hz to 20kHz impedance curve so you see all the data and read the frequency of interest. DATS2 is our favorite as it works with a laptop, is small and also the cheapest of the options. To show the versatility of DATS2, Fig 2 below shows a DATS2 curve run on a 32AT70 loudspeaker. To get the same reading as an impedance meter, you would read the impedance at 1kHz o the graph, but as you can see, there is a wealth of information in the curve. In this example, DATS2 is calling out about 281 ohms at 1 kHz, close to the 300 the impedance meters will read. For those with an understanding of the math, the power at 1kHz will be 5000/281 = 18W. The lowest impedance is around 450 Hz at about 190 ohms, giving 5000/190 = 26W. So as you can see, even though the transformer is rated at 30W at 4 ohms, when used with a speaker the real power is quite different. When this same transformer is loaded with a 4 ohm resisitive load, the reading is 140 ohms which is 5000/140 =3 5W, typical for a 30W rating. So all contant voltage transformers, regardless if they are 25V, 70V or 100V, only have a nomial power rating at a nominal load impedance - results will vary in use!